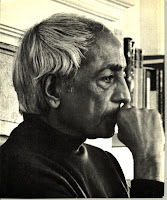 Krishnamuri (1895-1986) is one of the greatest philosophers of the age - The Dalai Lama. Kirshnamurit went from his origins in a small south indian village to become one of the great spiritual teachesr of twentienth century. He taught that the only way to peace on earth is in the transformation of the human psyche. This transformation is a truth each of us must discover within ourselves. Selections made by Evelyne Blau.